The above improuvements were based on feedback received from readers of my book such as yourself. Further comments/remarks/wishes are welcomed. Where can I buy the English edition? 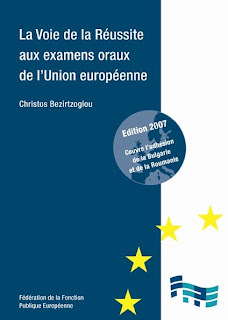 If you work inside the EU institutions, you could find the book in the majority of the internal Press Shops (Berlaymont, Charlemagne, Beaulieu, Justus Lipsus, Jacques Delors). Finally, if you live in Brussels, in addition to the normal bookshops (i.e. The European Bookshop, EuroComment Bookshop, Filigranes, Eponyme, Sterling Books), you would also find it in the kiosques around Place Schuman, (i.e. 1992, Pericle) and Place Madou (i.e. Press Factory).